It’s a Bird, It’s a Scooter, It’s an Overnight Sensation . . . But Is It Legal? Electric scooters have recently appeared overnight in cities across North Carolina. 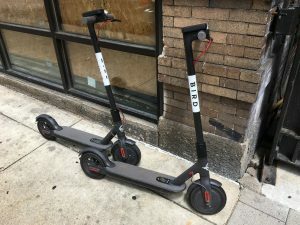 The scooters, most of which are owned by the Bird Rides company, have been deposited without advance announcement in downtown areas. Would-be riders download an app that allows them to scan a code on the scooter that unlocks it. The scooter can then be ridden for $1 start-up charge plus 15 cents per minute. The app instructs users to ride in bike lanes where available and to avoid pedestrians on the sidewalk. It also states that traffic regulations prohibit riding on sidewalks, in public parking structures, without a helmet, and without a valid driver’s license. Is all of that correct? And can these scooters lawfully be operated on North Carolina streets? What sort of conveyance is a Bird scooter? Electric scooters are vehicles under North Carolina law. See G.S. 20-4.01(49) (defining “vehicle”). They are devices by which a person may be transported upon a highway and they are not moved exclusively by human power or used exclusively on fixed rails or tracks. And they do not appear to meet either of the exceptions to this general definition. The first exception applies to a device “designed for and intended to be used as a means of transportation for a person with a mobility impairment, or who uses the device for mobility enhancement.” Unlike motorized wheelchairs, stand-on electric scooters do not appear to be designed for the mobility-impaired. As for the use of the device “for mobility enhancement,” the court of appeals has rejected the notion that a person without a mobility impairment who rides a motorized scooter for recreational purposes is using the device for mobility enhancement within the meaning of G.S. 20-4.01(49). See State v. Crow, 175 N.C. App. 199, 123-24 (2005). Instead, the court construed ”mobility enhancement” as being “closely related” to the term “mobility impairment” and rejected the argument that the addition of this term (in a technical corrections bill) substantively expanded the mobility impairment exception to the term vehicle. The second exception to the definition of vehicle applies to an “electric personal assistive mobility device,” a term that was added to Chapter 20 in 2002. This device is “a self-balancing nontandem two-wheeled device, designed to transport one person, with a propulsion system that limits the maximum speed of the device to 15 miles per hour or less.” G.S. 20-4.01(7b). While electric scooters meet several components of this definition—they have two wheels, are designed to transport one person, and are reportedly limited to 15 miles per hour—their wheels are tandem (one behind the other) rather than nontandem (parallel) and they are not self-balancing. The conveyances that qualify as electric personal assistive mobility devices are most commonly referred to by their brand-name: Segway. For just these reasons, the court of appeals in State v. Crow, 175 N.C. App. 119, 123–24 (2005), rejected the defendant’s argument that the motorized scooter he was riding was an electric personal assistive mobility device. Why does it matter whether Bird scooters are vehicles? Vehicles that are intended to be operated on streets or highways must first be registered with DMV. See G.S. 20-50(a). Several types of vehicles are exempted from this requirement, including farm tractors, motorized wheelchairs, and electric personal assistive mobility devices. See G.S. 20-51. But none of these exemptions appear to apply to electric scooters. If electric scooters are vehicles and they are not exempted from the registration requirement, they must be registered to be lawfully operated on streets in North Carolina. The registration issue associated with driving Bird scooters is much like the one encountered in years past by municipalities that wished to authorize the driving of golf carts on city streets. Golf carts are vehicles that are not exempted from registration requirements. Yet G.S. 20-54(8) prohibits DMV from registering golf carts. So absent some other grant of authority, cities could not permit golf carts to be driven on their streets. To give local governments that authority, the General Assembly enacted legislation in 2009 allowing cities and counties to regulate golf carts. This also is the legal issue that companies operating Segways avoided through enactment of the 2002 legislation exempting personal assistive mobility devices from the definition of vehicle and from registration requirements. That legislation also prescribed rules for the operation of such devices on streets, permitting them to be used only on streets with speed limits of 25 mph or less, sidewalks, and bicycle paths. See G.S. 20-175.6(c). Municipalities may adopt ordinances regulating the time, place and manner for driving electric personal assistive mobility devices, but they may not prohibit their use. G.S. 20-175.6(d). What about driver’s license requirements? As a matter of policy, Bird states that its scooters may only be ridden by a person who is at least 18 years old and has a driver’s license. In the first regard, company policy exceeds the requirements of North Carolina law. A person must be licensed to drive a motor vehicle on a street or highway in North Carolina. Electric scooters appear to meet the definition of “motor vehicle” as they are self-propelled vehicles and are not mopeds (for which no license is required) or electric assisted bicycles. Thus, if an electric scooter is driven in the street, its driver must be licensed. G.S. 20-7(a). There is, however, no state law requirement that a person be 18 to drive a motor vehicle. What about helmets? Bird instructs drivers to wear helmets and offers to ship helmets to active riders, charging only the cost of shipping. I know at least one rider who has availed himself of this offer. The company’s guidance exceeds the requirements of state law, which imposes helmet requirements for motorcycles and mopeds, all-terrain vehicles, and for children under 16 on bicycles, but not for other vehicles. What about public parking structures? I’m not aware of any state law that would prohibit unregistered electric scooters from being driven in public parking structures, though given their sleek physical profile, I can certainly see why doing so would not be advisable. Finally, can you get a DWI on an electric scooter? Yes. G.S. 20-138.1 prohibits the driving of a vehicle on a street, highway or public vehicular area while impaired. The court in State v. Crow, cited above, upheld the defendant’s conviction for DWI based on his driving of an electric scooter while he was impaired. Don’t get me wrong. This post is not intended to be referendum on the merits of electric scooters on North Carolina’s streets. People seem to be having a great time zipping around town on them. Its purpose instead is to point out that our existing regulatory scheme doesn’t appear to sanction their operation in many of the places where they are currently being used. If policy makers want to change those laws to authorize electric scooter use, the 2002 Segway legislation provides a roadmap for accomplishing that objective. Update. A few people have asked me to explain my conclusion that electric scooters are not mopeds. The term moped is defined in G.S. 20-4.01(27)j as a vehicle, other than a motor-driven bicycle or electric assisted bicycle, that has two or three wheels, no external shifting device, a motor that does not exceed 50 cubic centimeters piston displacement and cannot propel the vehicle at a speed greater than 30 miles per hour on a level surface. The motor may be powered by electricity, alternative fuel, motor fuel, or a combination of each. While an electric scooter meets each of these statutory criteria, I’m skeptical that the legislature had electric scooters in mind when it wrote this definition. The term “moped,” which precedes the definition, is a term in common usage that is ordinarily understood to mean a conveyance that resembles a motorcycle or motorized bicycle in appearance in that it has a saddle seat, handlebars, and tires.The inclusion of the exception for motorized bicycles in the statutory definition implicitly acknowledges this similarity in appearance. I think the disconnect between the common understanding of the word “moped,” and the broadest possible construction of its statutory definition justifies looking beyond the plain language of the statute to the legislature’s intent. See, e.g., State v. Beck, 359 N.C. 611, 614 (2005) (“[W[here a literal interpretation of the language of a statute will lead to absurd results, or contravene the manifest purpose of the Legislature, as otherwise expressed, the reason and purpose of the law shall control and the strict letter thereof shall be disregarded.’”) (internal citations omitted). The definition of moped was amended in 2016 to provide that the motor could be powered by electricity, alternative fuel and/or motor fuel and was recodified in Chapter 20. The specific reference to electric-powered motors might be pointed to as evidence that electric scooters are part of this definition. These changes were made, however, in conjunction with the legislature’s enactment of requirements that owners of mopeds provide proof of financial responsibility before a moped may be registered and that they maintain such a policy throughout the registration period.See S.L. 2016-90. Those changes followed legislation two years earlier requiring that mopeds be registered. See S.L. 2014-114. I am doubtful that, in enacting these changes, the legislature envisioned the registration and insuring of electric stand-up scooters and, for that matter, other devices like hoverboards and motorized skateboards. A contrary interpretation is, of course, possible. Beyond the broad definition in G.S. 20-4.01(27)j, one might point to the language in the Department of Transportation recommendations that led to the registration and insurance requirements, which refers to mopeds and motor scooters. Yet I don’t think DOT had electric stand-up scooters in mind any more than the legislature. Why does it matter whether electric scooters are mopeds? For registration purposes, it doesn’t. Vehicles (not just mopeds) have to be registered. The implications of an electric scooter being classified as a moped would be the addition of financial responsibility and helmet requirements. This is a great post. When I read an article from the News and Observer last month indicating that Raleigh had the bird scooters in their jurisdiction, I couldn’t understand why they were allowing them to operate in clear violation of state law. Can you say more about your conclusion that these motorized scooters are not mopeds? I know a number of city attorneys across the state have come to a different conclusion. Yes. I am updating the post to do just that. Check back shortly! I think not, because a moped must be a “vehicle”. Excellent point, Allen. I think you are correct. I’ll update the post to remove that reference. Love your work, keep it cominf. Thank you for keeping providers informed of the new or updated laws. I appreciate the work you do. I think that electric scooters should be considered mopeds because both have very similar characteristics and can be equally dangerous for drivers and pedestrians. I dont know about the legality of the scooters, but at 73 i cant move like i usrd to, and this morning i almost got plastered by two young scooter riders on the sidewalk in downtown Raleigh. I thought it was illegal to ride them on the sidewalk. Hmmm, where’s the accountability? You wrote: “Vehicles (not just mopeds) have to be registered.” Perhaps you mean MOTOR vehicles, not vehicles. Bicycles, horse-drawn carriages other non-motorized vehicles need not be registered, and yet they are fully qualified as vehicles for roadway use under the law. Electric-assisted bicycles have also been excluded from the definition of motor vehicles even though they include motors. Mopeds are excluded from the definition of motor vehicle in some sections of our state code, but included in others. For years, local police in NC have stopped and cited operators stand-up motor scooters when they violated the moped laws, such as by being underage or riding without a helmet. While the moped classification may seem excessive for lower speed electric scooters, it is the only logically applicable existing classification that police have available to them until the legislature changes the law. I visited Raleigh last week and as we walked and drove through we observed the Scooters sitting near doorways on sidewalks and at random locations. I had already been warned by my son who lives in Raleigh about the Scooter traffic. He said ” I am afraid someone will run into you or Dad on a scooter” I cannot understand how this company,,,Bird,,,can just show up in a city and make their own decision that they will distribute motorized objects that have the potential to hurt, kill or cause someone to be hurt or killed with no repercussions!!!!!.. Not to mention the over cluttering and chaos and disorder they cause on the streets. Questions for thought …What would happen if I decided that I was going to bring my motorized toys and distribute them to whoever I wanted and leave them wherever I wanted and was going to ask no one? My guess is that I would be before a judge or in a jail within 24 hours. Nice post. So, are these scooters “motor vehicles” as defined by 20-104(23)?